Angel Rodriguez scored 28 points to lead Miami over Wichita State and into the Sweet 16 on Saturday. No. 3 Miami was all over No. 11 Wichita State early. Hurricanes senior guard Angel Rodriguez scored a quick 17 points, and the Shockers only made one field goal for the first 11:49. The result was a 27–6 Miami lead with 8:28 left in the first half. But an 11–0 run by Wichita State over the next five minutes helped close the gap and shorten the lead to 10. At the end of the first half, Miami had shot 60.0% from the floor to Wichita State’s 24.1%. The Hurricanes led 32–19. But the Shockers weren’t done. They outscored Miami 24–10 to open the second half and took their first lead of the game on a three-pointer from senior guard Ron Baker with 10:29 left in the game. From there, it was back and forth between Miami and Wichita State. 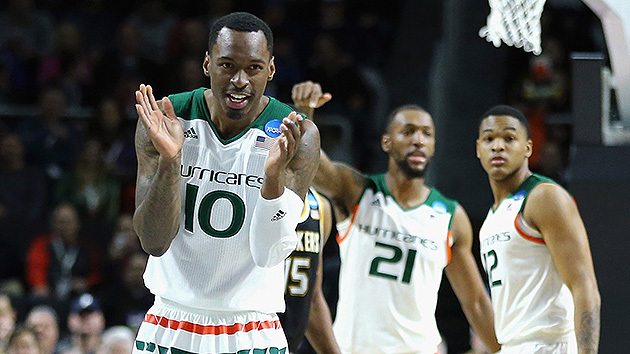 In the stretch run, the Hurricanes were boosted by strong a strong defensive performance from junior guard Davon Reed and some much needed offense from senior guard Sheldon McClellan (18 points on 5 of 11 shooting). Rodriguez led all scorers with 28 points, and the Hurricanes held on to win 65–57. The storied college careers of Ron Baker and Fred VanVleet are over. The two have played in a Final Four (2013), started a season 35–0 (2014) and made the Sweet 16 by beating instate juggernaut Kansas (2015). Under head coach Gregg Marshall, Wichita State helped change this program from an obscure mid-major that had made one NCAA tournament in the 2000s to an annual contender. Despite tired legs from playing three games in six days, the Shockers showed how tough they are by withstanding an early Miami run and making the second half competitive. The Hurricanes, for their part, have moved into the Sweet 16 for the first time since 2013, the last time they made the NCAA tournament. What Miami has done this season—and in the past few years—is a testament to coach Jim Larrañaga’s ability to build a program. Miami was an ACC doormat before Larrañaga arrived and is now in position for a deep tournament run. The Hurricanes will face the winner of No. 7 Iowa and No. 2 Villanova in the Sweet 16 in Louisville.